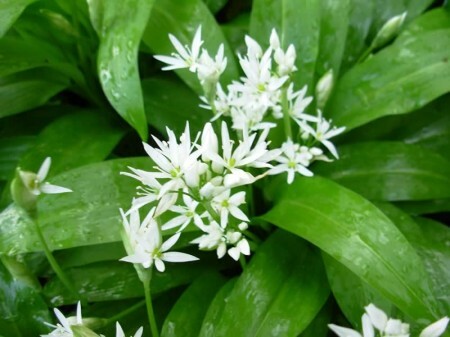 The wild garlic (ramsons) is just coming into flower. 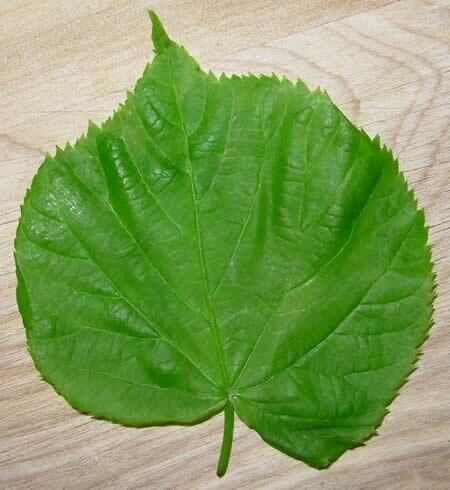 The leaves are great in salads or made into pesto. The flowers are delicious, they have a strong garlic flavour with a nice touch of sweetness and creaminess. Tulips are beautiful, this is taken in Nunhead Cemetery. According to Twinkel’s article in the latest Funky Raw magazine they are edible but somehow they look too good to eat! I don’t know what this is but it is very pretty. 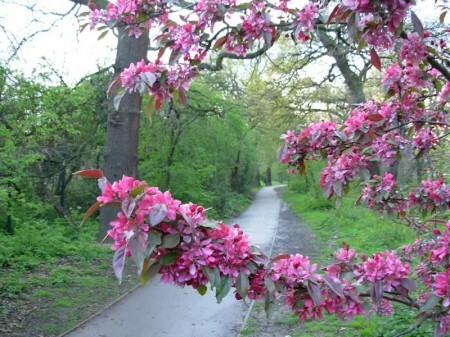 It’s in Peckham Rye Park. I like making pesto with basil, but it’s not really in season at the moment, so I used some wild leaves I collected. 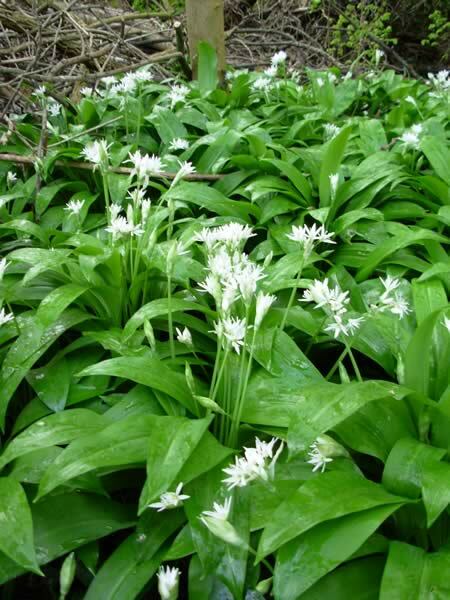 I used mostly wild garlic (pictured) (Edit: this is not actually wild garlic, it’s Wild Leek. Photos of wild garlic here. 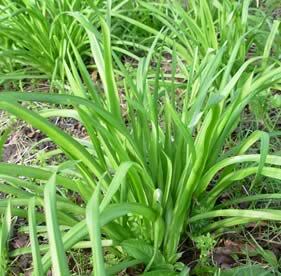 ), a few chives and a few sorrel leaves. I ground up a couple of handfuls of pine nuts, then added the leaves and some flax oil and blended. 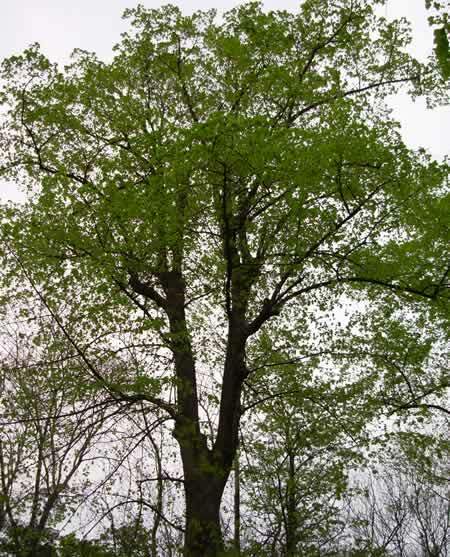 It had a strong flavour, delicious on a green salad of dandelion leaves and other wild greens. There has been a lot of speculation on this topic, I think it’s the first time I’ve heard David Wolfe say he eats ants. His viewpoint is pretty much the same as mine. If you’ve been eating rose hips you will know about the seeds, they can be a faf to remove and some of them are so hard that even the VitaMix won’t break them down. So today I discovered a very simple way of using them – I put them in the blender with my hemp seeds when I am making the hemp milk, so the flesh gets broken down and goes into the milk and the seeds get left behind when I strain the milk. The milk tastes prety good like this too. The latest addition to my breakfast of chocolate pudding is wild rose hips. They are in season now, you will find them growing all over the place, a local, highly nutritious superfood. First, gently squeeze the rose hip to check if it is ripe. 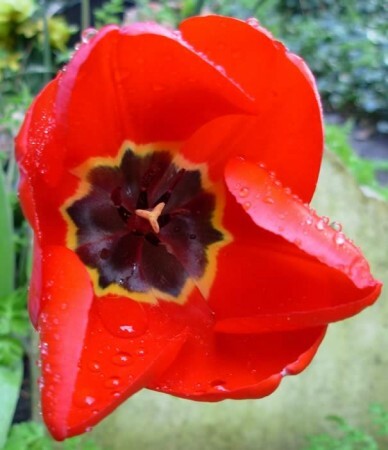 If it is firm then it’s not ripe, you want to feel for the softness and only very gentle force to pull it from the plant. Rose hips are full of seeds which can be hairy and irritating when ingested, although I find that when they are properly ripe they don’t cause problems. There is a technique to getting the seeds out – hold the hip in between thumb and finger with one hand, and with the other, gently break the skin around the closed end of the fruit then pull while squeezing with the other hand – if successful all the seeds will come out in a clump. The seeds are edible, they are high in vitamin E, just some of them are very hard. Rose hips are amazingly high in Vitamin C, according to Wikipedia, rose hips have 2000 mg per 100g compared to oranges with 50 mg and dried goji berries with 73 mg. I just recently found out that most animals can make their own vitamin C within their bodies, humans along with the other primates are some of the only creatures who don’t have this ability and have to rely on food for their vitamin C supply. It starts to get interesting when we look at how much vitamin C other animals make. According to this article by Bill Sardi “A 160-pound goat produces about 13,000 milligrams per day” and “A dog or cat will produce about 40 milligrams of vitamin C per kilogram of body weight per day, or the equivalent of 2800 mg per day if these animals were about the same size as humans.” Compare this with the RDA of 90 mg and you begin to think that something might be wrong. The Vitamin C Foundation suggest that humans might need 5000 mg per day. In the Sardi article, it is suggested that this kind of dose of vitamin C can increase our lifespan and health. So it all starts to fit together, by eating a raw food diet you would generally be getting a lot more vitamin C than the RDA, but maybe we need even more than that. I did a rough estimate of one day’s vitamin C intake for myself and it came out at around 500 mg, nowhere near the suggested 5000 mg. 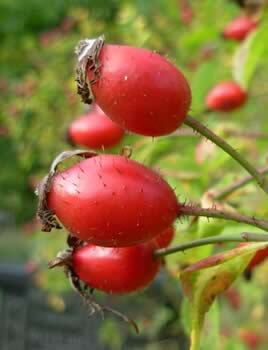 But adding 100g of rose hips per day could take that up to 2500 mg, so that’s what I aim to do while they are free and in season. If you want to learn about wild foods and you live around Bristol, check out www.gourmetfungi.co.uk (edit: link doesn’t work anymore) they offer various courses. They also sell wild food, including a wild food veg box, which defeats a main point of wild food (as the famous book says “Food for Free”), but hey, if you want nutritious food but don’t have time to collect it yourself, it might be for you! I’ve just added a few more answers on the FAQ page, including some info on the books I own on wild foods. I recently got back from a holiday in Lithuania, I’ll be posting some photos soon. I found lots of wild food in the forests including wild strawberries, raspberries and bilberries. Today I picked the first blackberries of the year, not many are ripe yet, but there are a few and they are delicious, larger and juicer than last year. I just ate some lime flowers for the first time, wow, they are delicious. Very sweet with lots of subtle flavours, I recommend you look out for them. 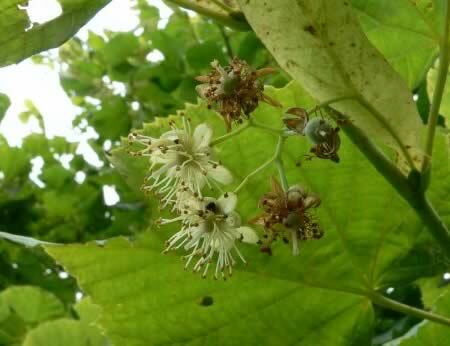 There is lots of info on lime flowers on the PFAF website including “Lime flowers are said to develop narcotic properties as they age and so they should only be harvested when freshly opened” so be careful! I’m slowly beginning to feel some level of confidence in being able to find a good variety of wild food. 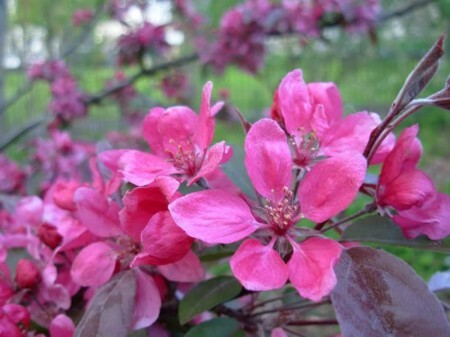 I’m eating plant leaves and flowers, tree leaves and blossoms, berries and small insects. I’ve recently started eating ants and have finally lost that squeamishness I used to get when eating insects. I’m sure I’d still get it with larger insects, but with the small ones I’m feeling like it’s a very natural thing to do.